15 negatives : b&w; ; 120 mm. Published in Rafu Shimpo, August 15, 1969, Japanese section, and September 9, 1969. 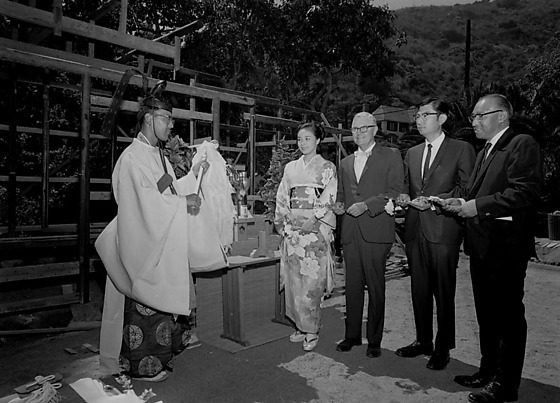 Miss Nagoya, Ruriko Kawahara, arrives at Los Angeles International Airport (LAX), attends a shinto blessing of future tea house at Wattles Park in North Hollywood, and makes public appearances in Los Angeles, California on the tenth anniversary of Los Angeles-Nagoya Sister City relations, August 15, 1969. 1N-3N: Miss Nagoya greeted at airport with bouquet of flowers by Caucasian and Japanese women and men on tarmac in front of airplane, including Miss Los Angeles Linda (?) and Nisei Week Queen Claire Nonoshita (Published 8/15/1969), and at a press conference in Japan Air Lines (JAL) VIP room. 7N-15N: Miss Nagoya makes public appearances at various locations, including City Hall, exchanging gifts with various politicians like Los Angeles Mayor Sam Yorty, and officials such as Consul General of Japan Kanji Takasugi. Kawahara wears a white lace dress and jacket with corsage, and white gloves, and a belted black and white floral graphic dress. Typed on original envelope: Nagoya Sister City - Miss Nagoya at Airport and City Hall. Nagoya, Japan is a sister city of Los Angeles, California. Ruruiko Kawahara was in Los Angeles to represent Nagoya in the Nisei Week festivities.